Eurostronomia is an Erasmus+ project connecting eight schools in eight countries namely Bulgaria, France, Germany, Macedonia, Portugal, Romania, the UK, Scotland and Slovenia. From 22nd to 24th September 2017 the first Transnational project meeting of the project Eurostonomia, Erasmus+, took place in Mortefontaine. Three teachers from St. Stanislav’s took part: Tine Golež, Martin Čokl and Alenka Battelino. We enjoyed the hospitality of the partner school OGEC Saint Dominique. All the partners participated in reviewing the application and intensively planning the activities for the first year. The first stargazing activity was organized by our enthusiastic physics teachers and we were discovering star constellations beyond the familiar ones. We all look forward to working together and opening new horizons in the field of astronomy through diverse perspectives. We are glad to announce that the first Learning Teaching Activity will take place in Slovenia at St. Stanislav’s from 10th to 16th April 2018. 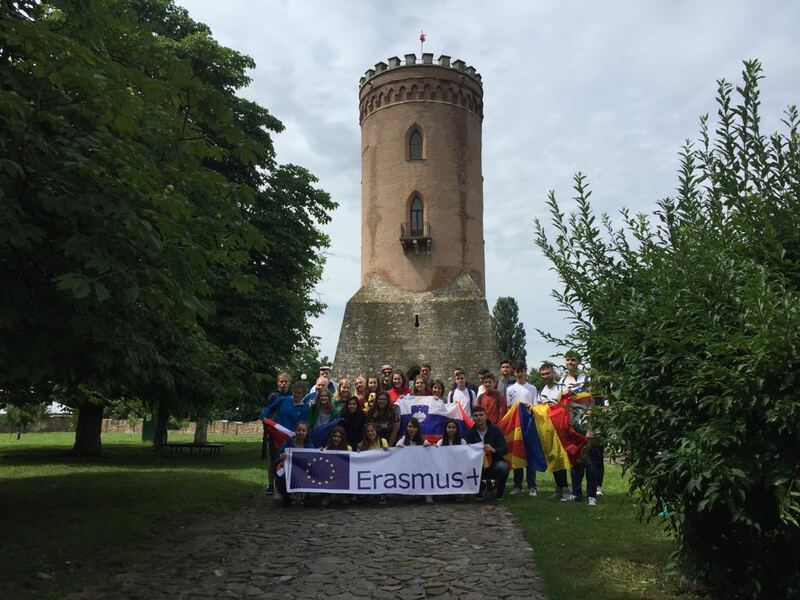 From 7th to 11th July 2018 the second Transnational project meeting of the project Eurostonomia, Erasmus+ took place in Targoviste, Rumania. Two teachers and two students from St. Stanislav’s took part: Martin Čokl, Anton Križnar, Aleks Kaapre Rehtijärvi and Alenka Battelino. This is the first time that students participate in project meetings so that their voice will be also heard throughout the project. This time they were working on composing guidelines for all future Erasmus+ students. They presented their findings at the plenary meeting held on the last day of the meeting. According to the coordinator of the project Mrs Susan Coontz (Wellington School, Scotland) they accomplished their work with excellence and contributed greatly to the success of the meeting. We enjoyed the hospitality of the partner school Colegiul National Constantin Cantacuzino. All the partners participated in reviewing the activities realized in the first year of the project and intensively planning the activities for the second year. The feedback of national agencies were discussed. The stargazing activity was unfortunately cancelled due to bad weather conditions. We visited the Institute of Multidisciplinary Research for Science and Technology from Valahia University of Targoviste and Museum of Human Evolution and Technology in Paleolithic, Stelea Monastery,”The Royal Court” Museum, Townhall and Old City Center. 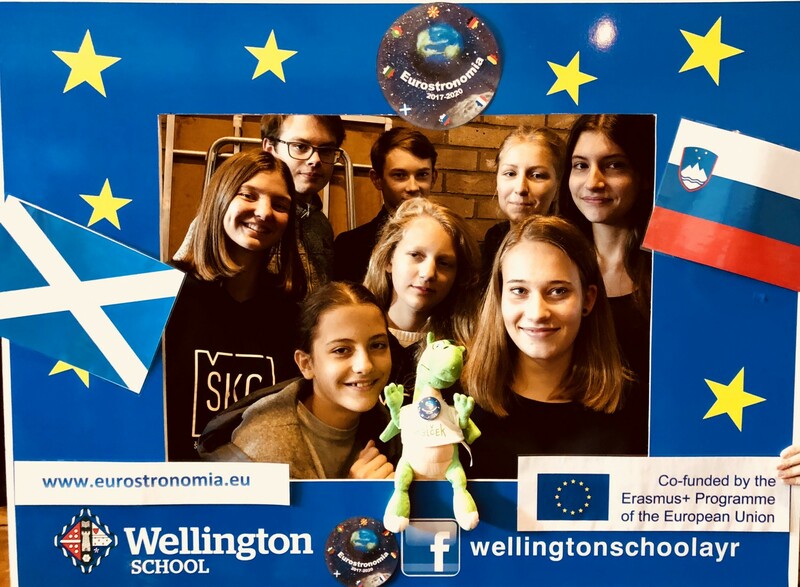 The second teaching learning activity for students and teachers in the Erasmus+ project Eurostronomia took place from 16th – 22nd September 2018, uniting 33 young astronomy enthusiasts from Germany, France, Portugal, Scotland, Romania and Slovenia. Three teachers and eight students from St. Stanislav’s (5 from high school and 3 from the primary school) took part: Tadeja Drašler, Martin Čokl, Matej Urbančič, Špela Plevel, Eva Jeraj, Ana Julija Prešeren, Eva Jocif, Filip Marinšek, Zala Vintar, Sara Lesar, Alenka Battelino. We participated in numerous amazing workshops, listened to fabulous speakers (e.g. prof. Martin Hendry, LIGO), watched highly interesting documentaries and movies on latest discoveries in the field of astronomy, danced Ceilidh, tried Scottish food, experienced a real Scottish storm and so much more. Mr Čokl had a workshop on constructing Mars Rover and Mrs Battelino had a workshop on East-West Space Race. You can see the programme and read the students’ blog at http://schule.mallinckrodt-gymnasium.de/erasmus+/eurostronomia/index.html. You can follow the project on twitter @eurostronomia.